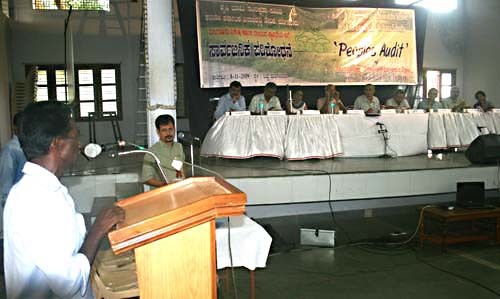 Activists organised a protest conference where the villagers told their stories. Several famous national activists were there too. "MANGALORE, November 10, 2009. 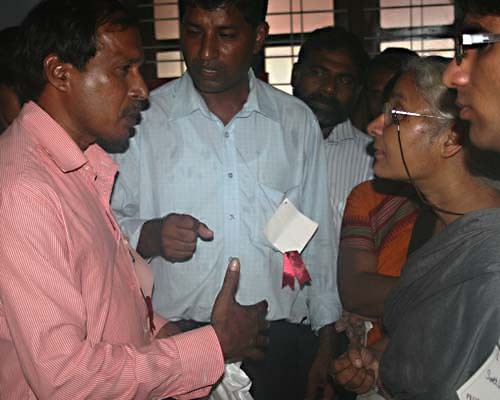 Members representing families displaced by Mangalore Special Economic Zone (MSEZ) project have demanded jobs for their family members. 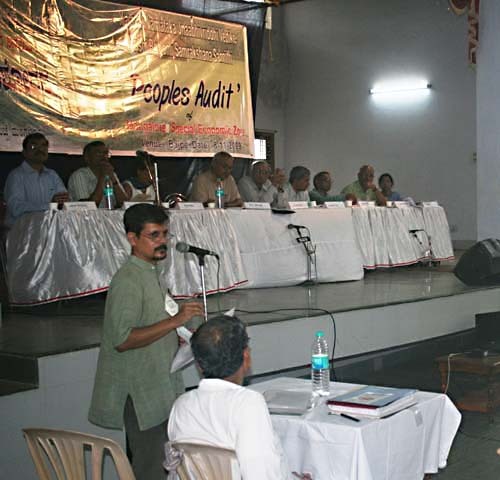 Their demand came at the 'People's audit of MSEZ' (..) at Bajpe. 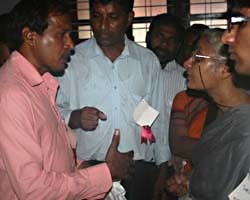 A panel of nine eminent persons listened to the grievances of the affected people. Social activists Medha Patkar and Aruna Roy were the special observers at the programme. Gregory Patrao, vice-president, Bala Gram Panchayat (village council) said that 404 families had been displaced by the project. Although there was pressure on him to part with his family's 16 acres of land in Kalavaru village for the project, he would not do so. He would fight a gainst the attempts being made at acquiring his family's land till it reached its logical end, he said. Mr. Patrao said that earlier his family had lost land in Kalavaru village to other projects. The family had parted with 90 cents of land for the Konkan railway project, 52 cents for the Mangalore Refinery and Petrochemicals Ltd. (MRPL) and 4.5 acres for the Nagarjuna Power Corporation's project. The Government had recently issued a notification for acquiring 2.5 acres of land owned by his family at Kulai village for constructing a coal storage yard for the Udupi Thermal Power Corporation there. (..) Mr. Patrao wanted to know where should his family members go if it were to lose the last piece of 16 acres held by it. He said that he had approached the Karnataka High Court against the Government's move to acquire the land and the final verdict was awaited. (Another person at the People's Audit:) 'I do not want compensation, I want a job. Earlier, when I owned half an acre of land at Kalavaru, there was peace in my family. I was earning daily wages by working in agricultural fields every day. Now there is no work because there is no land to cultivate,' he said. Mr. Kulal, a driver, alleged that the MRPL had not provided him a permanent job as was promised. Hence he was forced to work for a contractor working for MRPL." "MANGALORE, March 26, 2009. Students of the Dayal Bagh Agricultural Institute, Ujjire, staged a street play as a mark of protest against the proposed Mangalore Special Economic Zone (MSEZ) project, in front of the Deputy Commissioner's office. Similar protests against SEZs were held in various parts of the country. Directed by theatre artiste Krishnaiah, the play revolved around the lives of a farmer couple and their child. It focused on the possible environmental hazards of the MSEZ. The couple sell their farmland to promoters of the project who in-turn convert the village into a toxic wasteland. The play ends with the death of the child after drinking water from an industrially polluted well. The simple narrative of the play was punctuated by folk song and dance performances. Addressing the audience after the performance, coordinator of the self-help group Vimukti and producer of the play Wilfred Arun Moras said that awareness and uprising were the only way to combat what he termed 'corporate imperialism'." "MANGALORE, May 15, 2009. The fight against the Mangalore Special Economic Zone (MSEZ) Project received a shot in the arm with the Sangh Parivar organising a demonstration against the project. (..) protest in front of the office of the Deputy Commissioner here. They urged the government to withdraw the notification for acquiring 2,035 acres of land in Mangalore taluk to set up the second phase of the MSEZ. The Sangh Parivar warned of intensifying the agitation if the government went ahead with the second phase of the project. The leaders said they would not allow the company to set up the second phase at the cost of fertile agriculture land and livelihoods of people. They also opposed the Union Government's plans to build a Petroleum, Chemical and Petrochemical Investment Region close to Mangalore." From Deccan Herald, May 15, 2009: "Vasanth Yeyyadi said the SEZ is aimed at taking India into the dark folds of colonialism once again. 'As the law itself indicates, a SEZ is a foreign territory within the country. In the name of generating employment it just kills the jobs of those in the farming community and cottage industries,' he said." "MANGALORE, July 17, 2008. Karnataka Industrial Area Development Board (KIADB) special land acquisition officer (SLAO) Prabhulinga Kavalakatti lodged a complaint at the Panambur police station stating that he fears threat to his life by three people. 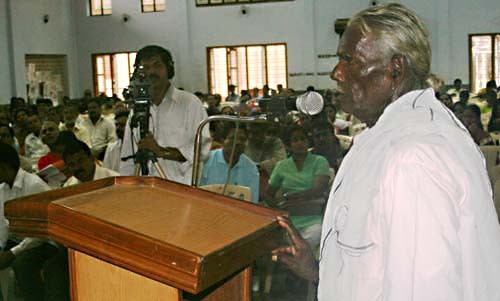 (..) Various organisations condemned SLAO Prabhulinga Kavalakatti's action in filing a life threat complaint against activists who were supporting the villagers' fight against MSEZ. Jamaath-e-Islami Hind Youth Wing Mangalore unit convenor Mohammed Kunhi stated in a release that filing false police complaint against people who fight for their rights was violation of Human Rights. (..) Ahinda (Minority, Backward and Dalit organisation) organising secretary Lolaksha stated that truth cannot be hidden by lodging false police complaints." 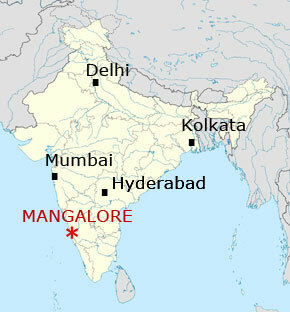 "MANGALORE, January 30, 2008. (..) More than 7,000 participated in a mega rally. (..) 'Most of the political leaders do not know properly what actually a Special Economic Zone is. It is a country within a country,' said Goa's Movement Against SEZ leader and former minister Matanhy Saldana. (..) 'No state and central law and no tax will be applicable for SEZs and they will have their own laws. Citizens who enter into a SEZ will be arrested by the special cops and punished.' Nobody would be there to pay compensation even if a citizen died due to pollution from SEZs, Saldana said. (..) 'Even when neighbouring China is running only seven SEZs, our leaders are keen to establish more than 500 SEZs,' he said and pointed out that when all the SEZs in China were under state hand, leaders in India wanted to make them private venture. It was because of the unified struggle by the people that all the 15 proposals of SEZs of Goa were cancelled, he informed." 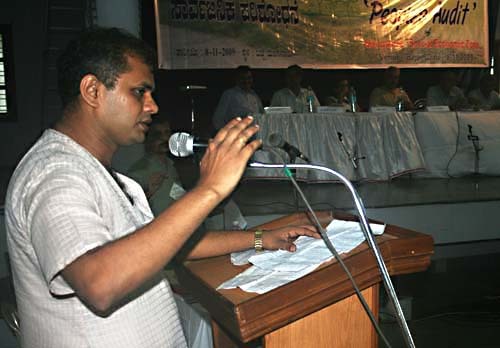 "MANGALORE, November 29, 2007. The public hearing on Mangalore Special Economic Zone (MSEZ) project held at Bajpe ended abruptly amidst pandemonium. Villagers who had gathered in full strength at the St Joseph's Church Hall in Bajpe shouted slogans demanding postponement of the hearing as the Environment Impact Assessment (EIA) report was not published in Kannada (official language of Karnataka) as mandated in the EIA notification. (..) Later more than 150 women marched to the Deputy Commissioner's office to demand postponement of the hearing." "MANGALORE, November 13, 2007. The Student community has thrown in its lot with the farmers in opposing the setting up of industries here. This was the message that emerged when students gathered at the Town Hall premises here and holding candles, sang 'Hachchevu Jagruthiya Deepa' (We will light the lamp of awareness) as a mark of solidarity to the farmers who have been protesting against the proposed special economic zone (SEZ). 'All industries starting here, promise jobs and give out assurances that students will benefit a lot from the industries. Let us know how many local youth got employment in the existing industries here?' asked Shilpi, the forum member who led the protest. Giving an example, she said only two candidates got appointment when a petro-chemical unit was set up here some time ago. (..) 'We students want good jobs. But certainly not at the cost of others livelihood,' she emphasised."